Oxford, Arts Council, Museum of Modern Art, Mary Martin: Kenneth Martin, May 1970, no. 18, ‘Rotation’ multiple exhibited: this exhibition travelled to Eastbourne, Towner Art Gallery, June - July 1970; Exeter, Royal Albert Memorial Museum, July - August 1970; Leeds, City Art Gallery, August - September 1970; Wolverhampton, Municipal Art Gallery and Museum, September - October 1970; Manchester, Polytechnic, October 1970; Sheffield, Mappin Art Gallery, November 1970; Kingston-upon-Hull, Ferens Art Gallery, December 1970 - January 1971; Norwich, Castle Museum, January 1971; Edinburgh, Scottish Arts Council Gallery, February 1971; Cardiff, Welsh Arts Council Gallery, March 1971; and Bristol, City Art Gallery, April 1971. Mary Martin was born in Folkstone in 1907 and studied at Goldsmiths’ School of Art and then at Royal College of Art, where she met Kenneth Martin, whom she married in 1930. Both Mary and Kenneth began producing their first abstract work in the late 1940s and then working on constructions in the early 1950s. They were closely associated with a group of artists that included Anthony Hill and Victor Pasmore. Mary described her work as ‘nuclear building’, describing the process as, ‘starting from one unit, subjecting it to a logic and accepting the result without any artistic interference or ‘placing’ and without any foreknowledge of the final appearance of the work’ (see Arts Council exhibition catalogue, p. 11). 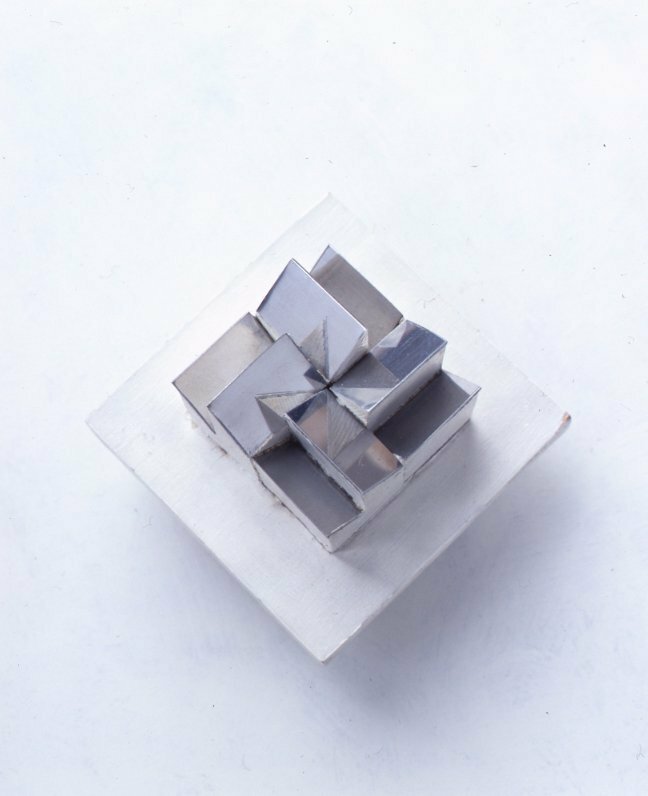 Rotation MM1 prototype, consisting of four identical units joined together on a base, the top surface of each is diagonally cut and mirrored. This white painted prototype is constructed of wood and mirror. It demonstrates that the process Mary used for her constructions could easily be adapted for mass-production as the actual Rotation sculptures were produced by injection moulding by Unlimited, Bath.